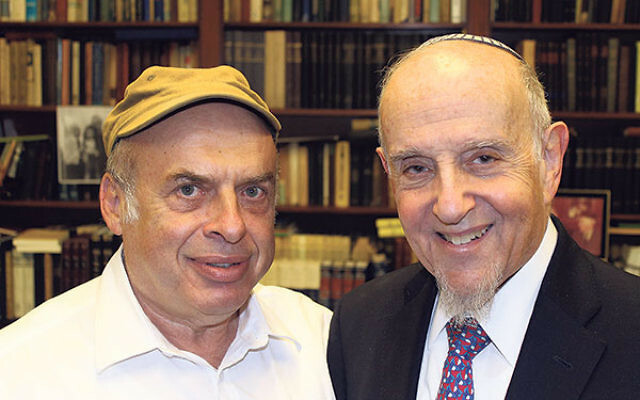 After Israel’s Chief Rabbinate rejected a conversion performed by prominent modern Orthodox Rabbi Haskel Lookstein, right, Jewish Agency for Israel Chair Natan Sharansky protested on his behalf. Three months after Israel’s Chief Rabbinate rejected his authority to perform conversions, one of America’s most prominent Modern Orthodox rabbis joined with Natan Sharansky to advance a message: The rabbinate needs to become more open. But not too much more. A widely respected rabbi in New York’s Orthodox community, Haskel Lookstein, saw his credentials called into question when a conversion he performed was deemed invalid by a rabbinical court in the Tel Aviv suburb of Petach Tikva. The court’s decision has amplified calls for the haredi Orthodox-dominated rabbinate to reform. On July 6, Sharansky spoke at a 200-person protest on Lookstein’s behalf in front of the Chief Rabbinical Court in Jerusalem. But in a joint interview the next day in New York, the changes Lookstein and Sharansky proposed were relatively mild. They want the rabbinate to recognize a wider range of Orthodox rabbis. Sharansky — chair of the Jewish Agency for Israel — wants the Israeli government to accept or reject rabbis according to a set of objective criteria. The two, however, stopped short of backing calls for the rabbinate to dissolve, to recognize non-Orthodox movements, or to surrender its monopoly on Jewish marriage and conversion in Israel. They’re not asking the rabbinate to change its core philosophy or mission — only its procedures. Lookstein, who has performed hundreds of conversions, is the former rabbi of Kehilath Jeshurun, a tony Modern Orthodox synagogue on Manhattan’s Upper East Side. He also previously served as head of school at the Ramaz School, an elite Manhattan Modern Orthodox preparatory school. The woman has appealed her case to Israel’s Chief Rabbinical Court, which held her hearing July 6 and was expected to deliver a judgment soon. Israel’s Ashkenazi Chief Rabbi David Lau has vouched for Lookstein, making it likely the Petach Tikva court’s decision will be overturned. But neither Sharansky nor Lookstein called for more radical changes to the rabbinate, which a coalition of Israelis — Orthodox and not — have pushed for. Pluralism activists in Israel have long called for the rabbinate to be abolished or replaced with a system that also recognizes non-Orthodox movements. According to polls by Hiddush, a group that advocates religious pluralism in Israel, solid majorities of Israeli Jews support instituting civil marriage in Israel and recognizing non-Orthodox conversions.